Earlier this month, the annual Big Apple Cider Trials were held at Putley in Herefordshire. 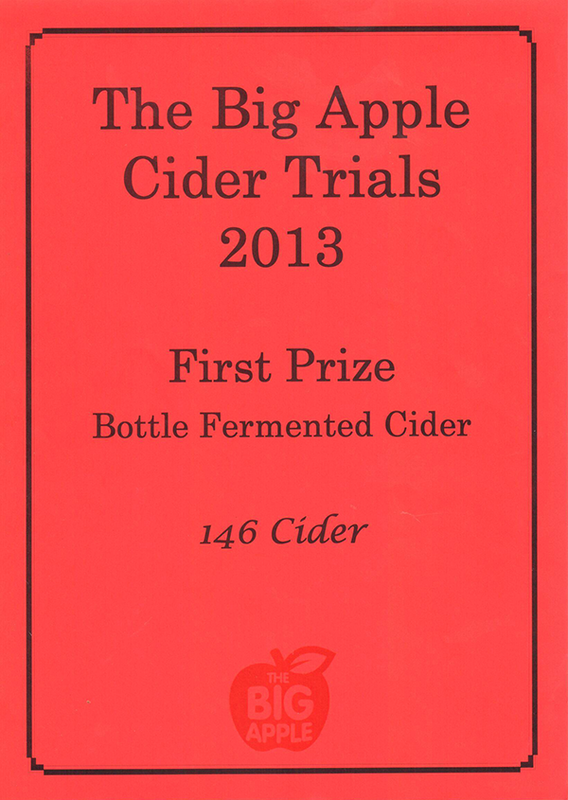 This is one of the nicest, friendliest competitions in the cider calendar each year (although being the fourth year of entry, I was keen to take it seriously and *try* to bring home a piece of paper. And it is with great pleasure that I can say we have achieved that. A first place too! For Hampshire Heritage Vintage which won first place in the Bottle Fermented Cider class. I am very happy about this - the class is hotly contested with some of the best cider makers in the UK (if not the world) entering, so it is very good to be associated (in a tiny way) with them. Hampshire Heritage Vintage is a 'Traditional method' cider. I could call it 'Methode Champenoise'... no, wait, I couldnt. It isnt from France and it isn't wine! However, it is a fully fermented Hampshire Heritage that is then layed down in a punted bottle to condition for a number of months with a charge of champagne yeast and additional sugar. Once it has finished its new fermentation in bottle, the yeast is riddled (caught in the neck of the bottle) and then disgorged (ejected). This creates a highly sparkling and clear cider that is mature and full of intense flavours. I am just getting ready to start racking my ciders - this is simply moving the cider from one container to another, which will then be left to mature before it can be sold. Why? Well, its all a bit yeasty at the moment, so that needs to settle out. It still has a little fermentation to do too - which is best done slowly and off the main bulk of the dead yeast that falls to the bottom of the tank as 'lees' once it has finished its job. People who read this may be familiar with the usual blends - Hampshire Heritage, Wild West and Eastern Delight. This year I have made several others though, and I hope to introduce these before they are released. 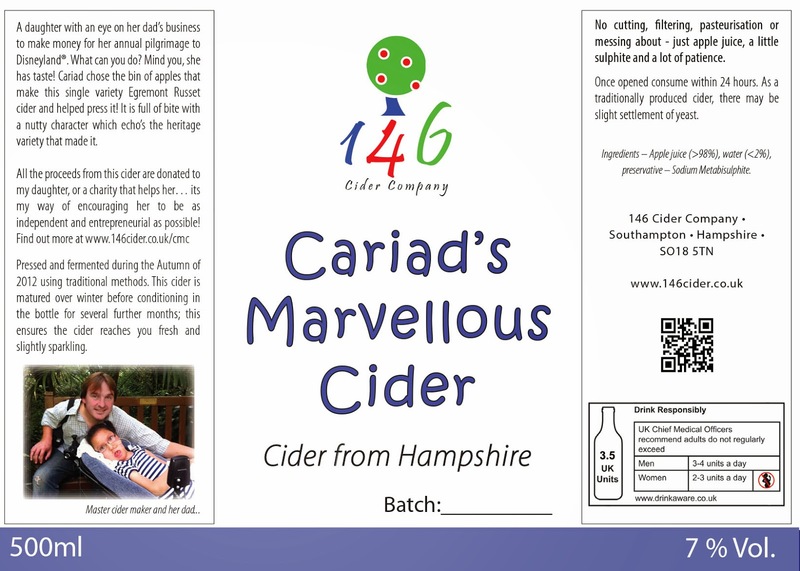 The first, and I guess it is an appropriate time to do so, is my daughters cider: Cariad's Marvellous Cider. This is limited to 400 or so bottles and is a single variety Egremont Russet cider. Single varieties are not the best a cider can be - let me put my cards firmly on the table to start with. However, Egremont is my favourite apple (when grown well) and, knowing this my daughter, Cariad, decided to hijack a bin of them for her own cider. These apples are out of Hill Farm Orchards; just down the road from me and producing some fantastic fruit (except for all the Braeburns they grow!). Now, she didn't press them all - in fact, she only helped me press about 5 litres with a makeshift press that I could get alongside her. Why? Well, this is a part of the reason for making a cider with her name. You see, my girl is physically disabled. Google Spinal Muscular Atrophy type 1 and you will quickly see why Cariad, my 9 year old teenager, is a very special girl indeed. And in order to make life as fun and 'normal' as possible, I aim to give her as much independence - including her zeal to make her own money. So - here it is! Last year, she made jam and chutney which her nan and grandad sold at their markets. This year, it is dads' turn... she figured she could make more money out of cider!